Years ago, if you needed life or disability insurance, you had to go through a full underwriting process. The full underwriting process usually consisted of a urine sample, blood pressure check, height/weight check, blood sample, among other things. Even if you needed $25,000, you had to go through this process, commonly known as a paramedical exam. Depending on the amount of coverage and your age, you may have additional tests such as an EKG. It’s easy to see how the insurance underwriting phone interview came about. Paramedical exams and the process are costly. Most of the time, these costs are borne by the carrier. The economics are simple: one can justify the cost of the paramedical exam on a $1,000,000 term life insurance policy, but not on a $10,000 one. Moreover, consumers want simplification and quickness. They don’t want to wait weeks on end for approval or not. Now, many carriers offer a simplified, non-medical insurance option. Some life insurance carriers offer it up to a certain death benefit such as $500,000 for term life insurance. Disability insurance carriers offer it up to $3,000 monthly amount for disability insurance. Anything over these amounts would have to go through the paramedical exam process. Many whole life policies have gone the non-medical route, too. In my opinion, technology and better data sources are the main drivers of the change. Most carriers are very comfortable with the non-medical underwriting process. Nearly all the carriers that offer a simplified, non-medical underwriting process pull your MIB report and your prescription drug history first. We talk about that next. What’s The MIB And Prescription Drug History? What’s the MIB? Long ago, it used to stand for Medical Information Bureau. Now known as MIB Group, it is a non-profit organization supported by member insurance carriers. When you apply for insurance – life insurance, disability insurance, long-term care insurance, etc. – and state you have a health condition, that condition is sent, via an encrypted code, to the MIB. The MIB records this history. So, if you apply for life insurance again, the carrier will pull your MIB report. It will see that you stated in a previous application that you have high blood pressure. Now, high blood pressure usually does not go away, so if in your new application, you did not disclose high blood pressure, the carrier’s underwriting team will get back to you and want to know why. The MIB Group is important to insurance. It keeps premiums fair and equitable across all applicants and policyowners. As for the prescription drug history check, it’s all out there. Nearly all the states approve the collection of your prescription drug history. There are a few companies who collect this information. Insurance companies have access to these databases. They will check your prescription drug history, making sure what you said on the application matches your history. If not, the carrier will question you. If you think you can avoid this, you likely can’t. At the end of the application, you will have to find at least 2 more forms: one that allows the carrier to look up your MIB report and another for the carrier to pull your prescription drug history. If you don’t sign, then you won’t be able to apply. What Is Asked In The Insurance Underwriting Phone Interview? 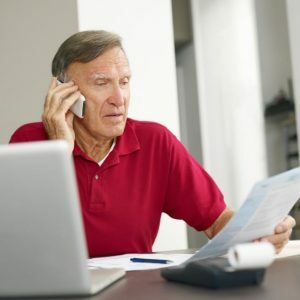 After the reports are run (and the carrier can run others, like a criminal history or a bankruptcy), then it is time for the insurance underwriting phone interview. Depending on certain factors, some carriers will not do this part. Others will pull your MIB report and prescription drug history while on the phone with you. However, nearly all carriers will have some type of phone interview. Depending on the carrier, the carrier will either give you a call at a separate time or the agent will transfer will call the interview department and transfer the phone to you for the interview. Usually, the phone interviewers will ask the health questions on the application again as a starting point (after your name and general identifying information). As they ask them, they are looking at your MIB or prescription drug history. If something doesn’t match, they will ask more questions. Once that happens, it is fair game. The insurance underwriting phone interview carries a lot of weight and can make or break an approval. Depending on your age, some carriers have other questions to test cognitive thinking. So, what is the trick to “aceing” this important step? Well, there is no trick. Sorry. You just need to be honest on the application and with your health history. There are many carriers and if you have a health condition which prevents you from getting Insurance “A”, likely insurance “B” can cover you. This is what an independent agency like My Family Life Insurance does. We do the front-end work to make sure we match the right insurance to your specific situation. Sorry. No “secret sauce” here. However, you can mess it up, and we discuss that next. You can mess up the phone interview by not being honest on the application. We touched on that already. The reason why is that the interviewer will see your MIB and your prescription drug history. He or she will compare them to your application. If the two don’t match, the interviewer will ask and likely decline your application. Let’s say you are honest on the application. Could you still mess up the phone interview? Yes. Here are two ways to do that. On, #1 – sometimes forgetfulness happens. As I mentioned, the carrier generally can see application history from 7 years ago. If something doesn’t match which adversely affect your application decision, not to worry. In this case, we usually have you order your MIB report to see what is on there. (Honestly, it is good to do that anyway, BEFORE applying.) Then, based on the information, we pivot to another carrier that can meet your needs. Or, if it is incorrect information, you can go through the steps to remove the inaccurate information from the MIB report. If you would like to order your MIB report, which is good practice to do so, the report usually comes in a week. Moreover, if you feel there is an error, we can go through the steps to correct it. #2 is a little more difficult. In our opinion, one of the keys to having a good insurance underwriting phone interview is to simply answer the question and not divulge any more information than what the question asked. If you say anything more, then it is fair game. The interviewer will then ask more questions which could negatively affect your application result. #2 can happen more than you think. For example – a true story – we had a client who applied for final expense/burial insurance. Burial insurance usually is non-medical underwriting with a phone interview. He was generally healthy, with a few health conditions, but confidently and honestly answered “no” to the health questions. This made him eligible for level benefits. His problem? He was a large man and overweight, but he still fit within the height/weight limits. You may not think that is a big deal, but this gentleman lost 100 pounds in 12 months. While he was happy about that – and every right so – life insurance companies don’t like that. They don’t like to see significant weight loss – or gain – even if it is beneficial. We coached the client to not discuss any additional information unless asked. During the interview, when the interviewer asked about our client’s height and weight, our client stated so. But, then he decided to tell the interviewer that he lost 100 pounds. That opened a can of worms and opened additional questions. You may not realize, but insurance companies add back half of any weight loss to arrive at an estimated weight. While I don’t agree, it is what it is. The add-back put our client out of the maximum weight limit and declined him. The moral of the story. Just answer the question and nothing more. Don’t lie, but don’t divulge any more than you have to. If the interviewer asked our client about any weight loss or gain, then our client did the right thing. But, the interviewer didn’t and the client messed it up. The insurance underwriting phone interview plays an important role as more and more carriers move from traditional underwriting process to a simplified, non-medical process. The way to “ace” the phone interview is to first simply be honest on the application. Then, don’t forget about your past health and application history. Finally, just answer the question and nothing more. Don’t go into detail unless asked. No need to. Your job is to simply answer the questions and move on to the next. Do you need assistance with non-medical underwriting and the phone interview process? We can help and have helped many people navigate the phone interview and application process. Contact us or use the form below. We would be more than happy to help you out. Of course, as with anything we do, we have your interests first and foremost.